For all those players who plan to build a FIFA 19 LaLiga squad, we’ve conducted an extensive analysis on the best players. 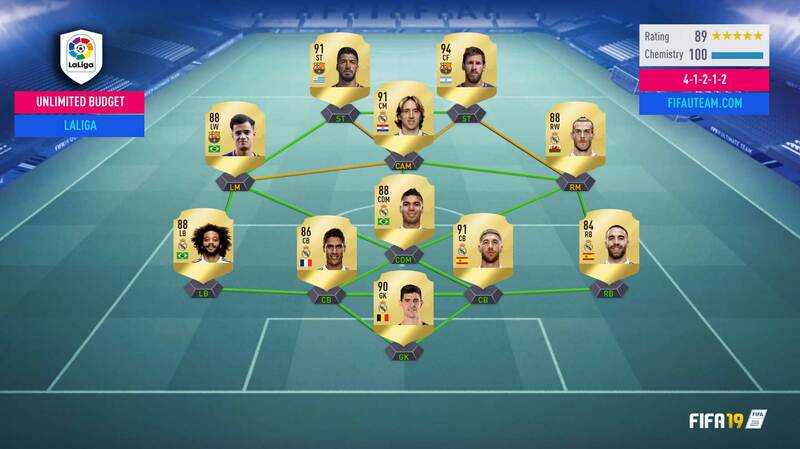 Here is our guide to the top Spanish league in FIFA 19 Ultimate Team. All of these steps are necessary to have; or it could mean that the team is not always well built as it could be. 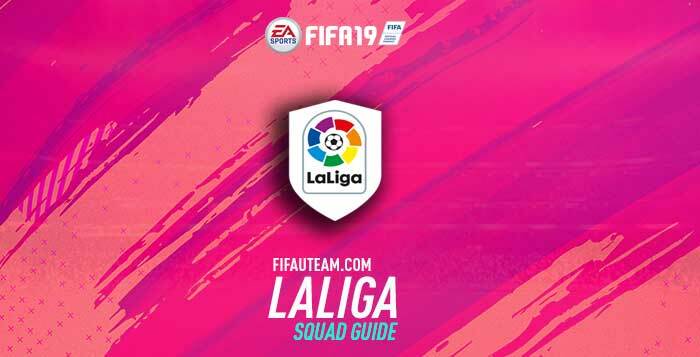 This article aims to help those that want to form a FIFA 19 LaLiga squad. Even the players that have a LaLiga team, could take out some valuable conclusions from this guide that could help you make your team even better. We received thousands of comments about similar guides that we have published in previous years. Most of them have asked us to help improve their teams and the players they had. It’s important that the readers understand that this guide is simply guidance. It’s a theme too vast and the player combinations are almost infinite. Besides, there are various factors that influence the choices, like one’s style of play, the formations and custom tactics used,the available budget, the preferences or even the time spent playing. There’s still one uncertain component: a good player for someone might not be for another. If there was a better team everyone would fight to get it. 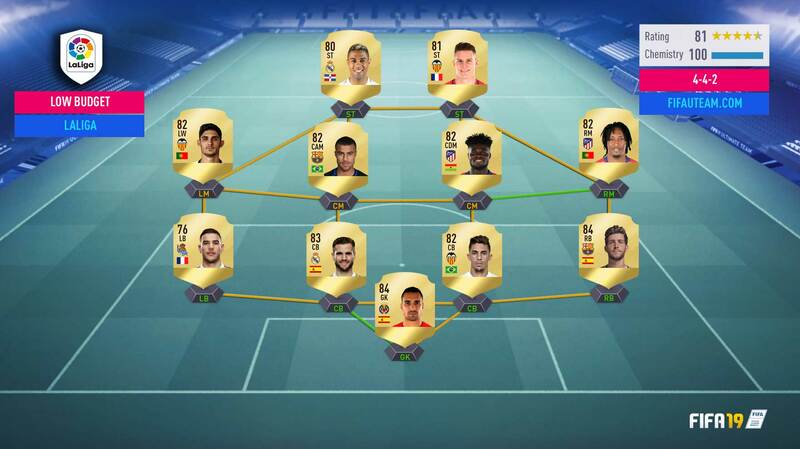 Part of the fun of FIFA 19 Ultimate Team is this: everyone has their personal club and players. Remember that this year, we published separate LaLiga guides for each position. You can visit them, clicking in the colourful links in the top of this page. In this guide we didn’t consider players that have been transferred to other clubs or that have been reviewed (UP). Only players that started their season in the LaLiga and with their original attributes were considered. In the chapter where FIFA 19 LaLiga squads are suggested, we added a link where you can check anytime the updated prices. Arguably no league has as good players as the main football competition in Spain. The qualification for the champion is made through the points system. Whichever team gathers the most points wins the league. The first four classified gain access to the champions league in the following year, while the fifth and sixth qualify for the Europa League and the last three trade places with the first two promoted from the Segunda División and with the play-off winner. Every season starts in August and finishes in May, having 38 game weeks with 10 matches each, being a total of 380 matches per season. The LaLiga is the third most watched football league in the world and the best league classified in the UEFA league coefficients. Started in 1928, LaLiga has only been conquered by nine clubs. The dominant clubs are Real Madrid and Barcelona, with a total of 33 and 25 titles. Atlético de Madrid (10), Atlético de Bilbao (8), Valência (6) and Real Sociedad (2) were the other teams that have won the league more than once, while Deportivo la Coruna, Real Bétis and Sevilla only won the title once. There are many great player choices to make which will make an even better team for you to aim to build. But, since it’s the league with better players, their prices are high. Only the Premier League players are more expensive than these ones. To the players with a limited budget, there are other better options. The team suggestions that follow are simple graphic indicators of the LaLiga articles already published. They should serve merely as orientation because it’s impossible to build a team that fits everyone. They depend on various factors we don’t know such as budget, formation, custom tactics, style of play and player preferences. To try and explore the needs of the maximum player as possible we suggest three teams with different budgets and formations: 4-1-2-1-2 with unlimited budget, 4-3-3 with medium budget and 4-4-2 with a low budget. The choice for this team’s players was based on the analysis made on previous guides. Courtois is the natural choice to the goal. However, you will be in safe hands if you use replace him by Oblak. Sergio Ramos keeps on being the boss of the defensive foursome. His weakest point is the attacking work rate and that’s why someone more defensive should play next to him. That’s the case of Varane. These two are getting better and better every year. Marcelo imposes himself at the left back position, while at right back Carvajal is good enough to take the position. You can also use Nelson Semedo in case you need more pace. To the midfield you have basically two options: Modric as CAM and Casemiro as a CDM; or Modric as a CDM and Isco as a CAM. It’s up to you to decide how you will use the Madrid’s midfielders Casemiro, Modric, Isco and even Kroos for these two spots. In our opinion, you should only follow the second option if you have an attacking style. Modric is originally a box to box CM but he can play at high level on the CAM position. Besides that, Casemiro will give you much more security to your defensive line. Not even Kroos has the defensive skills he has. One of the good things that happened to this league was the new position of Messi. Thanks to that, Bale has now room on our starting eleven, and Coutinho can play on the opposite side. The two spots of the attack are obviously for Lionel Messi and Luis Suárez, an amazing goal machine. The choices for this more affordable team players was based on analysis made previously. In goal, Navas is perfect for this squad. He is leveled with the best goalkeepers of this league, except in his height. Giménez and Paulista are both fast and solid defensively. Carvajal is the only player who keeps his spot on this team while Filipe Luís’s assertiveness completes our defending foursome. To the central position of the midfield, our preference goes for Kondogbia, since he has the muscle that every midfield needs and also for his balanced attacking and defensive skills. Saul and Rakitic complete the midfield. Lemar and Dembélé are two very popular young players with guaranteed place in this team. Over the attack line, Rodrigo is our first choice. He’s fast, has good skills and was one of the most important upgrades on this league. However, if you need someone stronger and with better heading stats, you should try Diego Costa. If you still have some room in your budget, you should try Promes. He was one of the most pleasant surprises on this year. Alba and Kroos are even more expensive but they would improve this squad a lot. The choice for this budget team was based on analysis made previously. Asenjo is our choice for the goal. However, if you have a few more coins, upgrading to Neto would be a good improvement. Sergi Roberto, Gabriel Paulista, Nacho Fernández and Theo Hernández complete the defence. In the midfield, Thomas Teye Partey and Rafinha complement each other well. The first one is strong, quick and aggressive, while the second is a player that usually pushes forward to assist his colleagues. The Portuguese wingers Gelson Martins and Gonçalo Guedes fill the wings in order to assist Gameiro and Mariano who have both been chosen for their combination of pace and finishing stats. This team could be cheaper if we wanted but for a small effort you can add players like Paulista, Partey and Mariano who will make a huge difference in the way your team will play. 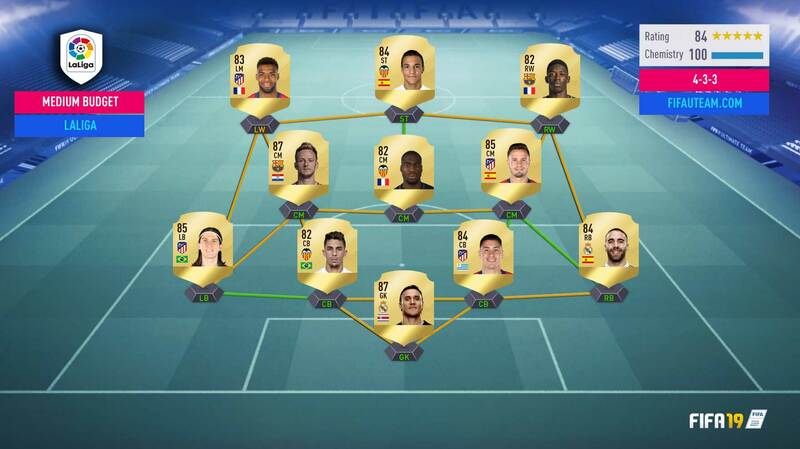 Follow our tips and you’ll become more successful on FIFA 19 Ultimate Team with your LaLiga Team. Just looking to these stats, I would choose Ramos and Puyol. After completing our squads with unlimited budget squad suggestion, what is the best way to spend our coins? By buying icons or special cards or something else? or should i try another formation? Can you save for Bale? Are you going to update the squads after the ratings refresh of winter upgrade? Sorry, we won’t because it would mean that it probably would change our choices. Suárez! I also think you should buy a top CB. which Position shoud i improve, have 125K left. Hi. In my personal opinion, you need a top CB for your LaLiga squad and also for your second team. Your fullbacks from EPL could also be better. thanks. i changed lenglet for godin and also dembele for aspas in my laliga Squad. now Looking for new fullbacks EBL. Probably boudebouz, partey and mariano are easily improved but they have behaved so well that I am not sure… what’s your opinion? Thanks! Hi. Do you play with a main squad and a fitness squad from the same league? I do but I wasnt aware of the substitue ‘always 5 chem’, I just read your articule about that. Maybe I can have a fitness team based on any other league, is that what you recommend? Hi! Don’t know if you already did it, but you can see our suggestions for Serie A here. I believe that it is easier to have a fitness squad from another league but there are always pros and cons. You can read more about it here. thanks for the advice. so the La Liga team looks good right? I have 170k coins now but I believe it’s best to spend them on the fitness Serie A, do you agree? Yes, I agree. I’m a Serie A fan and you definitely have a lot of room to improve your ‘fitness squad’. what do you think? should i replace em or stay with my current squad? To be honest, your first team looks great. Maybe you should keep with it and make a few adjustments (Fabinho SIF would be sick). Hello. I am struggling about the best formation, especially in the midfield. It depends on your play style but with those players you can try Casemiro as CDM and Isco + Modric as CMs. What would be the next steps for me ? It looks a good team. Your choices looks OK to me. They depend on your play style but they seem to be well picked to me. -> What do you think about this? I dont have a stable play style now, I still lack using chances for finess shots, do a lot of short passes until I get through the defense (most times through the mid). Due to your articles I changed my (LaLiga) formation to 4-1-2-1-2 and figuered out some good working custom tactics for me. Defending is harder without ZMs, but I like the feeling and pressure of that formation. P.S. : A article to fuse all your stuff into one would be really cool. So in this/my example a full guide of the best (*LaLiga)-Team with just gold players, the formation that you need to get max chem out of this players, the chem styles you would use for them and matching custom tactics. Maybe some informations about the play style, that works best with this. Hi. As we said, it is not easy to pick chemistry styles when it is not to us. It depends on many factors. That’s also the problem we have on your suggestion. An article with all that things looks great but it is not easy to cover all those aspects in a general way. And I have 140k to spend. But I’m not deciding what should I do. What is the best option do you think? – Getting Umtiti and Casemiro and selling Alvaro(IF). – Getting Coutinho and Casemiro and keep rest of the money. You would for option 1. You will see a good improvement and will keep money to invest during the Black Friday. Yes, we have plans to publish it in a few weeks. I have a few players in mind for hybrid. Did you change your guide style?I like the old one better when you included top 5 players per position.What do you think? Ups I didn’t see that list. Wow just amazing!!! i love your work with this guides. Keep on the hard work. I am currently playing a decent PL squad. I guess the market value is about 4-500k as Lucas and Dembele Are untradeable. The problem is that upgrading my team is really expensive now. I think I could get a really good La liga squad instead. Would you recommend trying it out? Would be your best squad minus the attacking three. In my opinion, Serie A still has the best value for money teams. Prices are still very high and for that reason, you have two options: you keep with the team you have for a few more weeks; or you buy one from another league. Your PL team looks nice. I ended up with a hybrid, using La Liga defence and Brazillian attack for now. Its working out great. I find the chinese league Brazillian a great value for coins spent. However, my luxury problem now is that I sant to keep Lucas and the defence, but still upgrade the squad. I packed Aubameyang from Squad battle rewards and am above 300k og I sell him. I am considering going for Isco and Griezmann/ Suarez. Which would boost the attack, but loose 2 chem for Lucas. There are no la liga right wingers comparing to him except for Bale atm. Another option is 4-4-2 and using Aubameyang with firmino as right striker. I know he might be better than both Suarez and Griezmann. If I do that, i can switch Paulinho with Saul/Kroos and get a full La liga squad except for Lucas. Do you see any other good options? When are you going to put FIFA 19 Serie A Squad Guide? We are working on that. Expect it this week.